Dogs can develop this condition the same way humans do. Kidney and bladder stones in dogs is a very serious problem that will be painful and may even be fatal. It must be treated under veterinary supervision, and adjustment to your pet's diet will be required. If you prefer to cook for your pooch, then these homemade dog food for bladder stones recipes will come in handy. According to most recent findings, today's dietary recommendations for dogs with bladder stones are different from what was recommended a few decades ago. Diets should not be restricted in protein, phosphorus or calcium. A 2002 AVMA study found that feeding dogs a low-carb and high-protein diet reduces the risk of bladder stones. Therefore, a minimum of 1 gram of protein per pound of dog's body weight everyday is recommended. In addition to this diet, remember that water intake will be the crucial component for dealing with bladder stones in dogs. Take any opportunity to encourage your dog to drink water or otherwise consume fluids (through homemade food or canned dog food) and urinate. Adding a little salt will encourage your pet to urinate more, and several studies found that sodium intake actually helps to deal with bladder stones. Do not confuse different types of stones. A diet for dogs with struvite crystals (or struvite bladder stones, containing magnesium ammonium phosphate) will be very different to a diet for dogs with calcium oxalate (CaOx) bladder and kidney stones. While these are technically homemade dog food for bladder stones recipes, remember that every dog and every case is different. It's crucial that you discuss any dietary adjustments and recipes with your veterinarian before feeding it to your pooch. 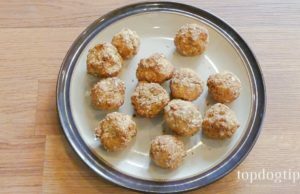 With that in mind, here are 13 recipes for homemade dog food for bladder stones that may help your pup. All leftovers can be refrigerated for 3-5 days and frozen for 3 months. Rinse chicken, place in casserole dish, sprinkle with salt, bake for 30 minutes. Drain and chop into small pieces. Cook rice according to directions on bag and your cooker. Mix ingredients together. Allow to cool. Chop in food processor. Serve with half of a banana (sliced). Fry liver in olive oil. Cook rice according package directions. Scramble eggs (or cook any way preferred). Mix all ingredients together and chop in food processor. Mix rice and meat with other ingredients. Vitamins can be ground into food or served separately. Boil egg and crush (with shells). Prepare mashed potatoes using the directions on the box. Mix all the ingredients together, grounding the vitamins and mixing in. Mix all ingredients together and mash or blend. Mix water, yogurt, eggs, and bread in bowl. Mix fruit together with ½ cup water. Whisk together eggs (yolk and whites) and water in bowl. Heat skillet over medium-high heat with 1 tsp olive oil. Clean pan, add 1 tsp olive oil. Heat skillet to medium high. Cook 2 minutes while rolling pan to distribute mixture. Sprinkle 2 tbsp of cheese on top of egg. Add half of the vegetables. Fold omelet and remove from pan. Mix flax seeds, ginger, broth, soy sauce, and vinegar in bowl. Add vegetables and stir fry for 5 minutes. Add lid and steam an extra 2 minutes. Add sauce mixture to wok and stir for 1 minute.